Dead or Alive: Dimensions is the latest in the Dead or Alive franchise since the departure of Tomonobu Itagaki from Team Ninja. Furthermore it’s the first ever Dead or Alive game to come out on a Nintendo Console and one of very few games to come out after the launch of the 3DS. 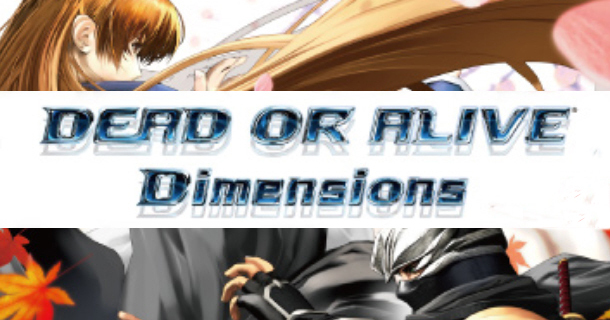 So does Dead or Alive: Dimensions bring the best out of the 3DS? Or should it just stay on the home consoles? Well the story of Dead or Alive: Dimensions is an actual recap of the story in the previous four games in the series (not including Extreme and Extreme Beach Volleyball) Every game is split into separate episodes re-telling the story of what actually goes on in that particular game for e.g. - episodes 4 and 5 are part of Dead or Alive 4. Jam packed with Ninja goodness! It gives great insight to what actually happens in the game rather than continuing onto the next fight and being confused in the process. The game is told in a weird way, where there is voice acting but with still character models so that it looks like there moving but they are not (hair will fly about though), but there are some animations that are really good and suit the story. This is the only thing that annoys me regarding the story as it is a bit inconsistent and throws me off, other than that the story is easy to understand; Kasumi is a Kunoichi who runs away from her ninja clan, in search of her missing brother and it expands to something bigger with each episode, moreover there are some video CG taken from the game and slotted into the right part of the story which was a nice touch. The gameplay formula hasn't changed much from Dead or Alive 4 but there are minor touch ups here and there. The fighting mechanic is easy to utilise when you have a button for each move: Punch, kick, grab and counter. The triangle system is the niche of this game and still is to date where you have to time the opponent's move and can counter it accordingly. This trait in a DoA:D can make sure players can have a fair fight with each other. Combos are pretty easy to pull off and also the 2nd screen displays the players move set so you can remember what to press next. Although I did feel that the 2nd screen was a bit hard to use, it was quite useful to remember combos so I didn't need to use it or look at it half the time. The modes are still the same as always in DoA:D where you have eight different offline play modes; Chronicle, Arcade, Survival, Tag Challenge, Free Play, Training, Local play and Showdown mode (this mode requires Street pass). you pick two characters but only lets you control one which is a let-down for a long time fans of the game. The Arcade mode is a little too easy to complete. The characters cast goes up to 25 characters (excluding clones) and you can finally play as bosses from previous games which is a great addition but the bosses are overpowered to the extreme! It feels unfair and cheap to play as them. The graphics on this game are simply amazing; DoA:D pushes the boundaries on what the 3DS can actually do for in-game graphics. If the 3D is turned off the game will go into full 60fps and run really smoothly; it felt as if I was playing on a home console and i am glad it felt that way. With the 3D on the game reverts to 30fps and it feels as if there is a bit of slowdown when playing. DoA:D doesn't depend on 3D, however when the winning animation is played with 3D on it does really look like its popping out. Furthermore when the 3D is on the character models do look as if they are coming out from the backdrops, which is great to see. Also the fan service has been a signature thing for the DoA series and it hasn't stopped nor toned down in Dimensions, which in my opinion is a good thing. Dead or Alive: Dimensions is simply one of the best games to come out on the 3DS since launch and I believe it’s actually giving Super Street Fighter 4 a run for its money. There are minor things lacking in this game such as a proper 2v2 and the story still being a bit off the wall at times. But the overall re-telling of the DoA story since the first game, stunning graphics and unlockables drown those problems away. Dead or Alive: Dimensions delivers in solid gameplay and beautiful graphics (the best I have seen out of a 3DS).